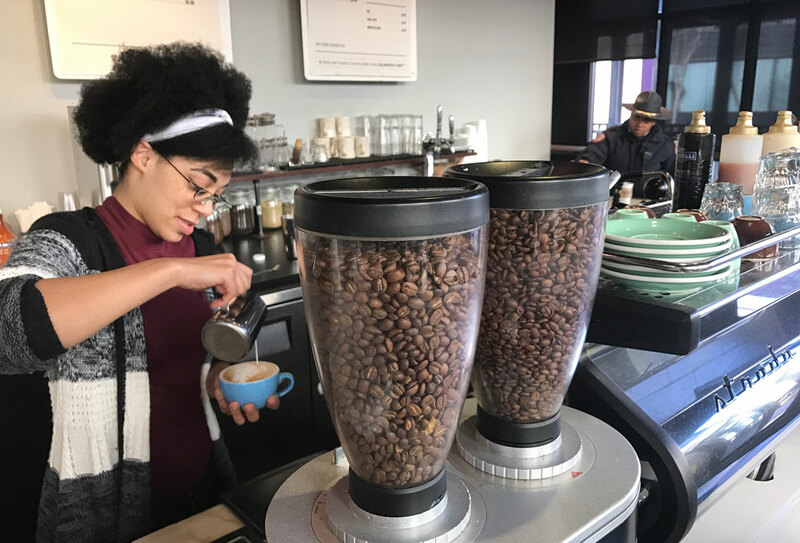 This coffee company goes way beyond the tenets of “fair trade” to improve the lives of people in Rwanda, where its coffee is grown. Founder Jonathan Golden, an organizational consultant and Anglican priest, was moved by the efforts toward reconciliation after the Rwandan genocide in 1994 that killed 800,000 Tutsis and moderate Hutus. In 2006, he bought 20 bags of coffee and a used roaster and started his business by selling coffee to church cafes in Atlanta. 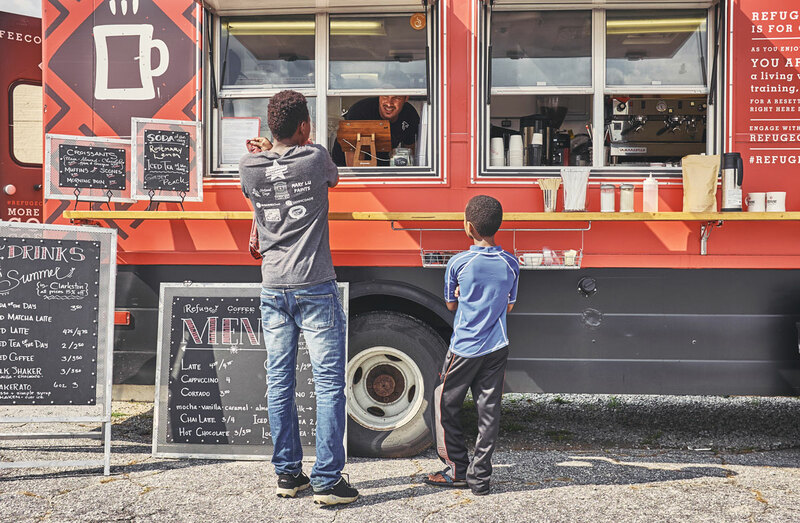 Look for the big red truck at the corner of East Ponce de Leon Avenue and Market Street in Clarkston, aka “Ellis Island South.” Your barista will likely be from Bhutan, Burundi, or another war-torn country. When founder Kitti Murray moved to Clarkston with her husband, a former pastor, a few years ago, she was struck by the work ethic of her refugee neighbors—but also by their lack of opportunity. She started a single coffee truck in 2015 as a way to provide jobs. Have a little patience with your servers. At this Old Fourth Ward restaurant, open only for Sunday brunch (9 a.m. to 1 p.m.), the person delivering your French toast is a volunteer committed to helping the homeless. 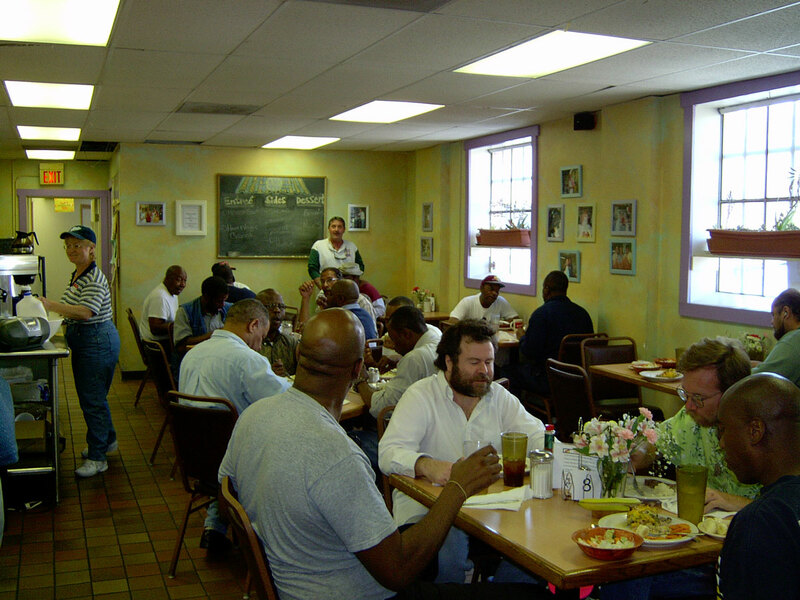 Café 458 first opened in 1988 as a way to provide dignity to homeless men and women who often waited in endless soup kitchen lines. Volunteers would serve the homeless, who could make reservations for a month of daily dining. Today, participants in the Atlanta Center for Self-Sufficiency program still receive restaurant-style lunches during the week, which, unlike the Sunday brunch, are not open to the public. Proceeds from the brunch benefit the ACSS, which teaches job skills to homeless men and women and supports them as they transition to work. In the kitchen, acclaimed chef Shane Devereux (Top FLR, Sound Table, The Lawrence) prepares chicken and waffles, shrimp and grits, and breakfast poutine, along with other brunch standards. 458 Edgewood Avenue, 404-446-4688. Life’s daily stresses make it tough for many of us to stick to a healthy diet, but eating nutritionally balanced meals is an even bigger challenge for many older adults and those with lower income who are homebound, disabled, or have chronic medical conditions. Tom Murphy, of Murphy’s restaurant in Virginia-Highland, created Good Measure Meals as a way to ensure nutritional but tasty meals for his mother. He began making the meals in the kitchen at Open Hand, a nonprofit that serves senior centers, homebound elderly, and low-income, chronically ill clients. Open Hand executive director Stephen Woods saw the potential for healthy meals both as a “social enterprise” and for preventive health. He bought Good Measure Meals in 2005 and partnered with the American Heart Association, the American Diabetes Association and others to focus on nutrition. This is your destination for the ultimate feel-good experience. Chef Ryan Smith’s creative, seasonally-changing dishes—prepared “with gratitude,” the menu says—won Staplehouse acclaim from Bon Appetit as America’s Best New Restaurant for 2016 and was a James Beard finalist for Best New Restaurant in 2016. (Smith earned another nomination this year for Best Chef: Southeast.) Yet this isn’t just a foodie hot spot. 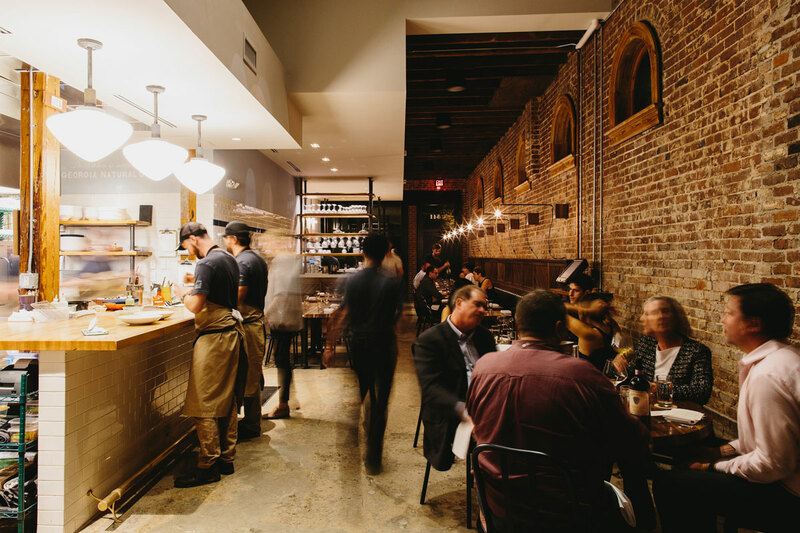 All the restaurant’s after-tax profits go to The Giving Kitchen, a nonprofit that provides emergency assistance grants to metro Atlanta restaurant workers who are struggling with an unexpected hardship. Owner Jen Hidinger and her husband, Ryan, became well-known in Atlanta’s dining community for the popular supper clubs they hosted in their home as they dreamed of opening a brick-and-mortar restaurant. When Ryan was diagnosed with stage IV cancer in 2012, an outpouring of contributions from the community helped cover the crushing out-of-pocket medical costs. Filled with gratitude, Ryan and Jen founded The Giving Kitchen to give back to others in need. In 2013, while Ryan was undergoing cancer treatment, Jen joined with sister-in-law Kara Hidinger and chef (and now brother-in-law) Ryan Smith to fulfill the Staplehouse vision. Ryan Hidinger died at age 36 in January 2014; the restaurant opened in the fall of 2015. Do you want to learn the secret techniques of Atlanta’s great chefs, such as Hugh Acheson, Ford Fry, and Kevin Rathbun? 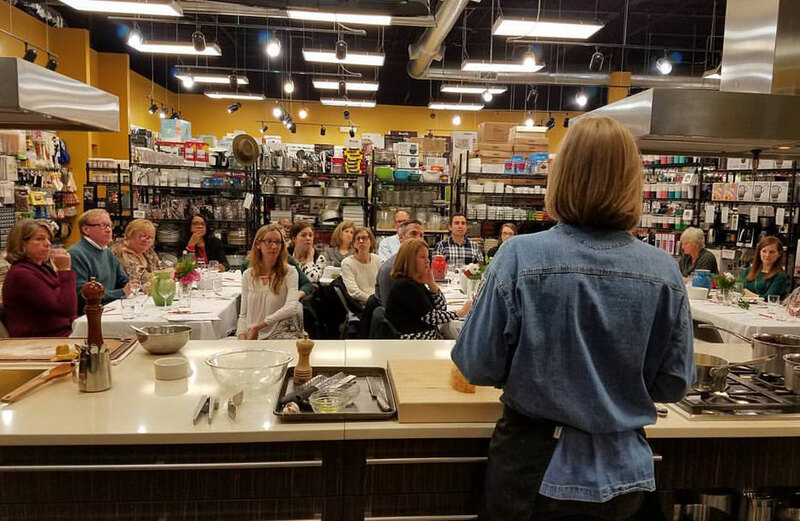 For $55, you can attend these two-hour classes to learn how to step up your game in the kitchen—and enjoy a sampling of the dishes and wine pairings. The chefs donate their time, The Cook’s Warehouse donates the wine, food, and staff, and all the proceeds go to the Atlanta Community Food Bank. In 2000, Mary Moore, founder and CEO of The Cook’s Warehouse, was on the advisory board when she was approached by Janice Reece, then head of marketing for the Atlanta’s Table program, which collects and re-distributes prepared foods from restaurants and events. Reece suggested a cooking class to benefit the food bank, and Moore readily agreed. Now chair of the Atlanta Community Food Bank board, Moore still teaches a class herself every year. Since 2000, Simple Abundance classes have paid for more than a million meals for people in need. The Cook’s Warehouse has locations in Midtown and East Cobb, 404-892-3333, x1248. This tiny shop is hard to find, but worth the effort. There’s no sign in front of the Clarkston International Bible Church to give you any clue of the bustling activity within. But park in the lot behind the church, enter through the rear door, and climb to the third floor. You’ll arrive at a room filled with goods sewn with vivid fabrics from Tanzania, Ecuador, and more. Catherine Palmer, a best-selling Christian novelist and daughter of missionaries, moved to Clarkston in 2008. 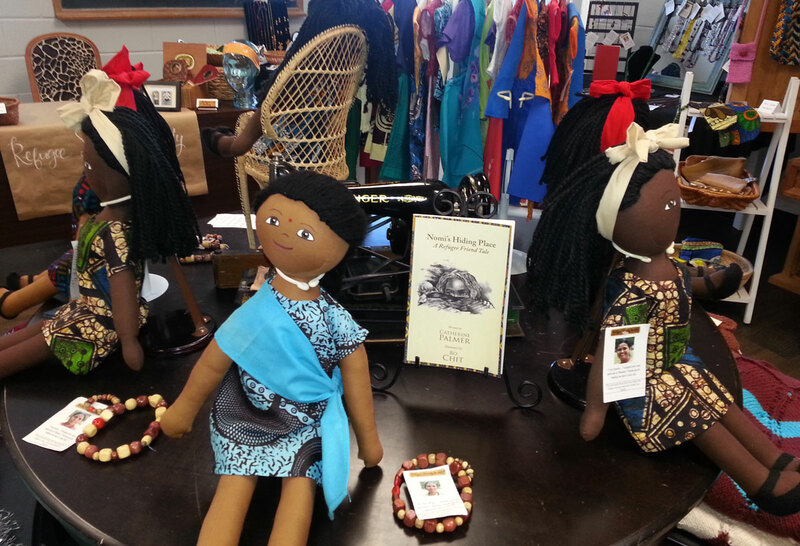 She got the idea to create Refugee Sewing Society for women who aren’t able to get traditional jobs, and she started the organization with three donated machines. Today, the program is run by Friends of Refugees, which also provides English classes and job assistance in the church. The women earn 60 percent of the proceeds; the other 40 percent pays for rent and supplies. The shop is run by volunteers, and products are sold at the storefront and at festivals around the metro area. Cars whiz past the nondescript house and small sign on North Decatur Road, but stop and explore and you will find the impressive and welcoming showroom and weave house, where formerly homeless women are literally weaving their lives back together. 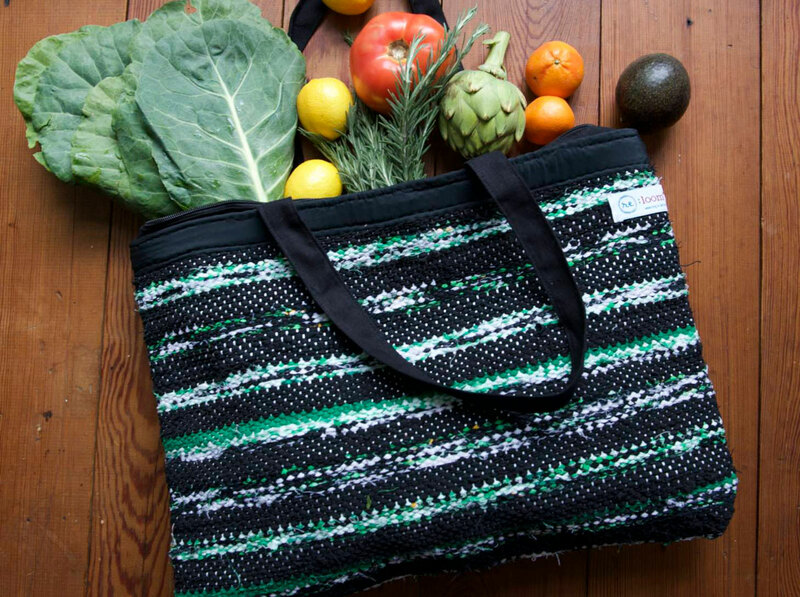 Re:loom teaches the women how to create beautiful rugs, pillows, placemats, and other home decor and accessories out of recycled fabric. They receive a livable wage and health insurance—and the enterprise helps fund the Initiative for Affordable Housing, which provides housing for the women and their children, as well as job and life skills. Lisa Wise, executive director of the Initiative for Affordable Housing, began re:loom as a way for her clients to build their skills and self-esteem in a stable environment. Each weaving project requires significant planning and attention to detail. Agnes Scott College donated the first loom, and weavers began part-time in 2010. In the past seven years, about 26 women have gone through the program. On a busy night, hundreds of people gather around the wooden tables at Krog Street Market with their beers, dinner, and ice cream, taking in the atmosphere but unaware of the role played by an idealistic former builder and his workshop of formerly homeless men. 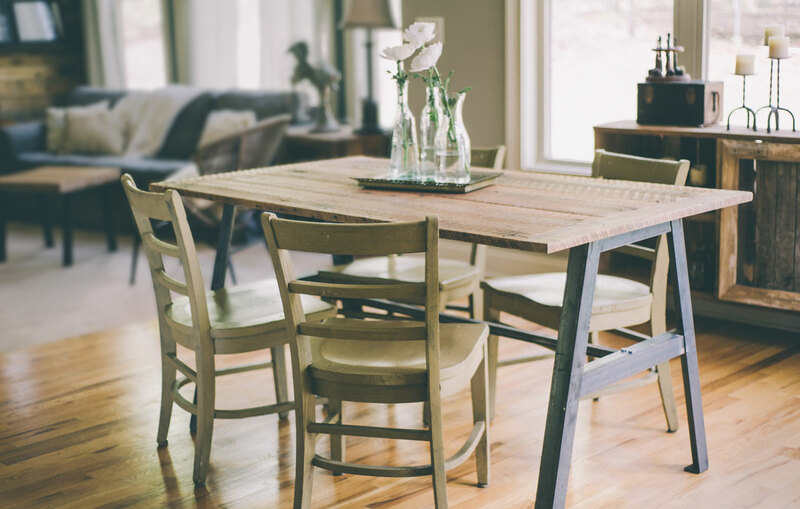 Lamon Luther, founded in Douglasville by Brian Preston, provides job skills, stability, and even homes for the homeless as they craft furniture out of reclaimed barn wood (and occasionally new wood, such as walnut). When Preston lost his homebuilding business during the Great Recession and began work as a creative arts director at a church, he became aware of a group of homeless men living in nearby woods. He regularly brought them firewood and food and spent time talking with them. He realized what they needed more than anything was a job. Preston and his wife, April, launched the business, named after Preston’s grandfather, in their garage, selling tables on Craig’s List. They opened their first shop in 2012, with Chick-fil-A as their first major client. Lamon Luther partners with the Atlanta Mission and addiction treatment providers to make sure their employees get the services they need. Their tables and benches range from rustic to contemporary, and they also create custom pieces, such as headboards or vanities. Beyond Krog Street Market, you’ll also see their tables at Ladybird Grove & Mess Hall, and the new Mercedes-Benz Stadium will feature 250 Lamon Luther tables. 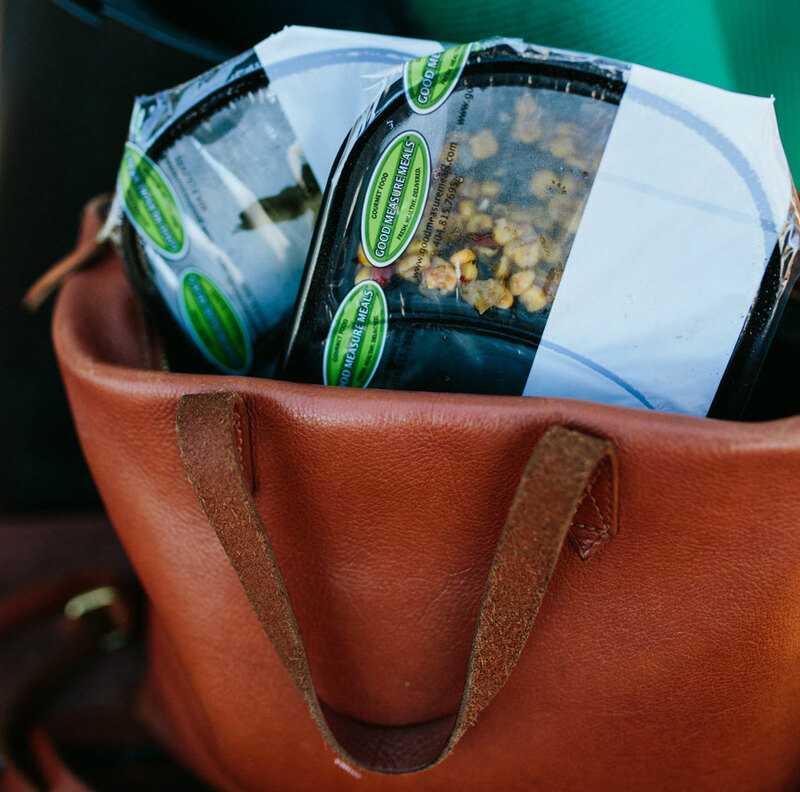 Sold at West Elm stores in Ponce City Market, Atlantic Station, and Avalon in Alpharetta. A showroom will open in or near Villa Rica this fall. At first glance, Ten Thousand Villages resembles a typical gift shop, but as you look around, you’ll begin to feel like you’ve discovered a global trading spot. The shop, a nonprofit run mostly by volunteers, is stocked with treasures from 47 countries, most of them in Latin America, Africa, and Southeast Asia. 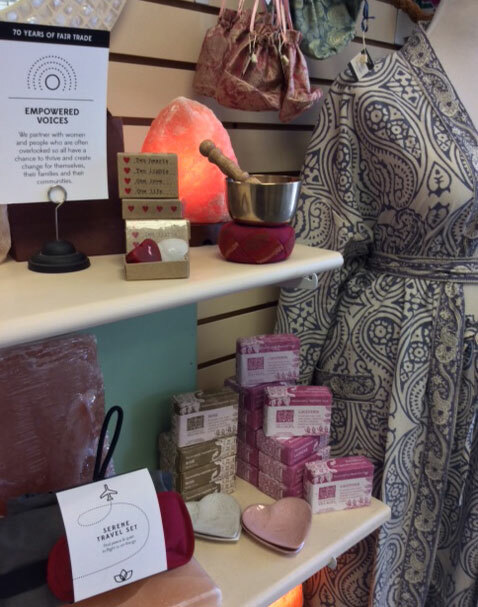 Shoppers can pick up stone pendants from India, Himalayan scarves made of soft bamboo fiber, wooden scoops from Indonesia, and tunics from Peru. Owners Karen Gross and Marg Lambert were moved by the poverty they saw on a trip to Guatemala, and Gross, a Mennonite, got the idea to open a gift shop from longtime fair-trade work among Mennonite missionaries. They started buying works from Guatemalan artisans and selling them at home gatherings and church functions. In 1993, they opened a store in Atlanta called Window to the World, which allowed them to widen their impact. They became a franchisee of Ten Thousand Villages in 1996.